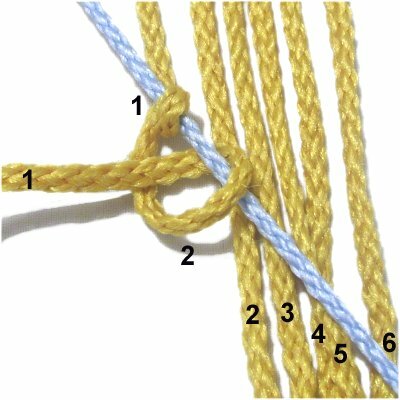 Description: The Double Half Hitch (DHH) is the primary knot used in Macrame. 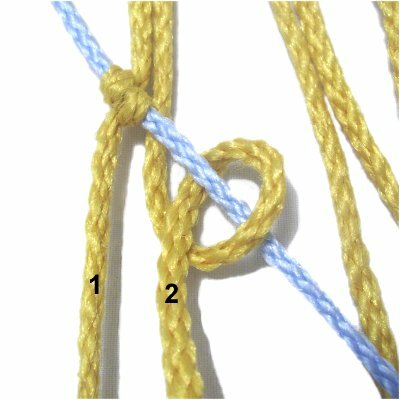 Most of the Macrame patterns in existence use this decorative knot in one form or another. This is a very important decorative knot, so you must know how to tie it, or many patterns won't make sense to you. By tying a series of Half Hitches with several cords, a raised bar will form. You can construct the bars in any direction, and even form elaborate shapes. 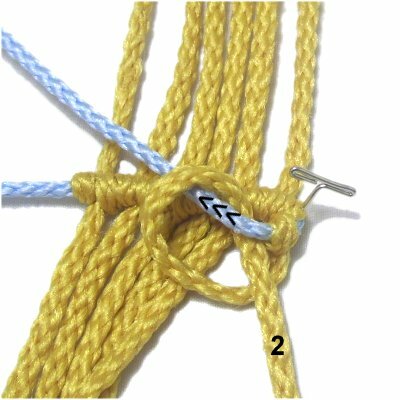 Double Half Hitch patterns show you how to make angles, zigzags and other common designs. Vintage Diamonds are just as popular now as they were in the early to mid-1900's. There are several ways to decorate the inside area, including folding, weaving, and tying knots. Double Half Hitches need to be attached to another piece of cord material, which is called a holding cord. You can also attach them to rings and dowels. Several cords are used to tie the Half Hitches onto the holding cord. These are called working cords. It helps if they are a different color than the holding cord. Make sure you understand the difference between the two types of cords before practicing. Step 1: Fold three 36-inch working cords in half, and secure them to your project board vertically. Mentally number the cords 1 - 6. Place the holding cord on top of the working cords, arranged horizontally. It should be straight and pulled so it has tension. Designer's Tip: The shape of the bar is determined by the holding cord. In this case, the bar will be horizontal. Step 2: Move working cord 1 over - under the holding cord, forming a counter-clockwise loop. As you pull it forward, it should pass over the working cord. Tighten the knot firmly, making sure the secured portion of the holding cord is straight. 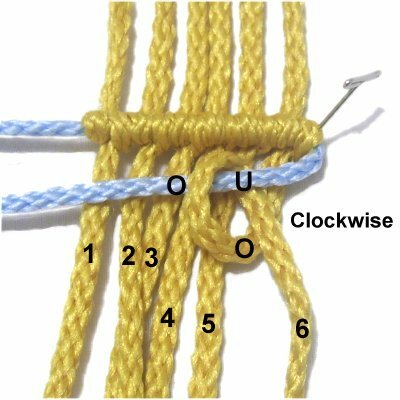 Designer's Tip: When tying the DHH from left to right as shown, the knots are always tied counter-clockwise. When moving right to left, they are made clockwise. Step 3: Repeat step 2, making a second Half Hitch to the right of the first. 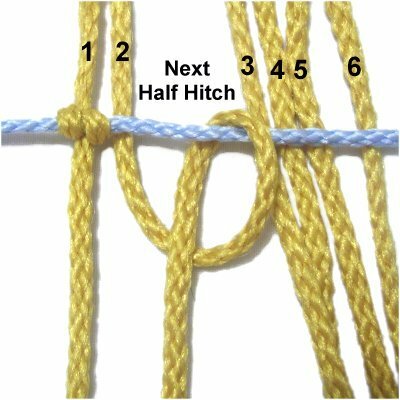 As you tighten, make sure the first Half Hitch does not loosen. 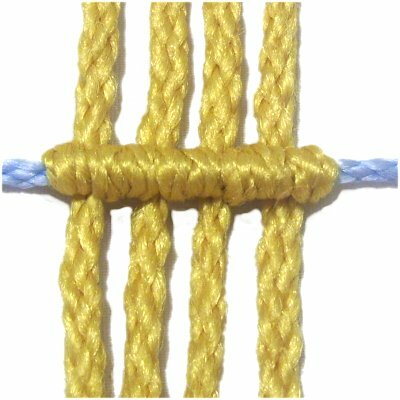 Steps 2 + 3 = one Double Half Hitch. 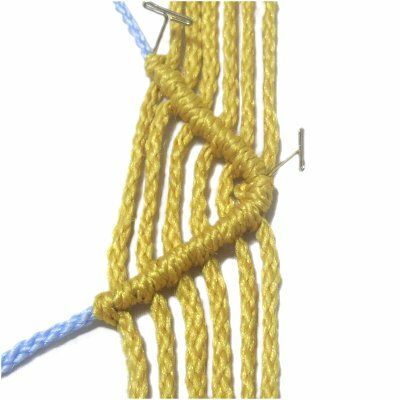 Designer's Tip: The Double Half Hitch is supposed to be quite tight compared to other decorative knots. The tighter you make them, the neater they will be. Both Half Hitches need to be the same size and rest next to each other without overlapping. 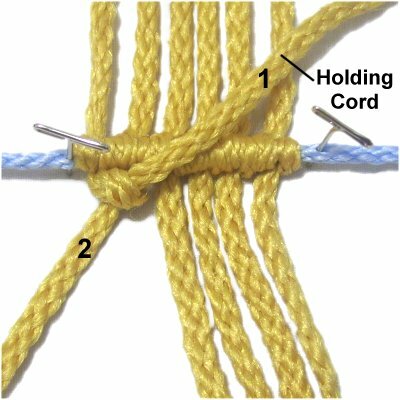 Step 4: Repeat steps 2 and 3 to make the next Half Hitch with working cord 2. Step 5: Repeat steps 2 - 3 with working cords 3 - 6. Make sure the knots are neat and tight. Now you are going to reverse the direction, making a second row of DHH. This gives you an opportunity to learn how to make sure the rows rest close together. Step 6: Secure the last DHH on the right with a pin. Move the holding cord towards the left (not secured). 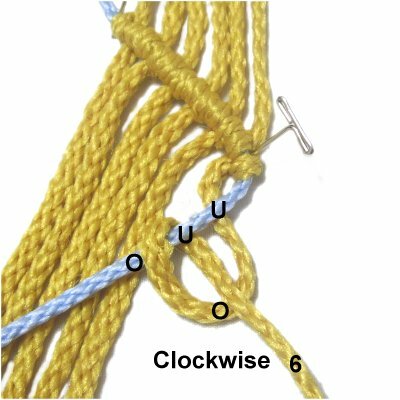 Make a clockwise Half Hitch with working cord 6. As you tighten it, straighten the holding cord so the knot is as close to the first row as possible. Designer's Tip: It's important that you are able to tie rows of DHH without securing the holding cord. 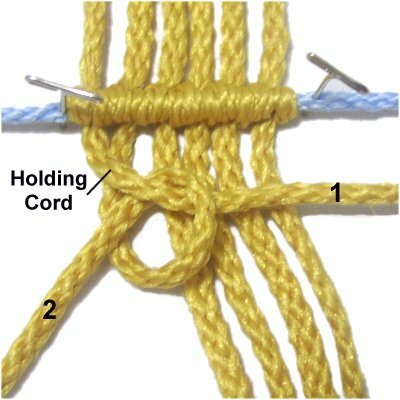 You can control the holding cord in one hand while tightening the knot with the other hand. Step 7: Make the second Half Hitch with cord 6. As you tighten it, move the holding cord towards the previous row, so the knots are close to each other. Then let the knot relax by moving the holding cord forward, so it's horizontal again. Step 8: Tie the remaining DHH with cords 5 - 1 (in that order). 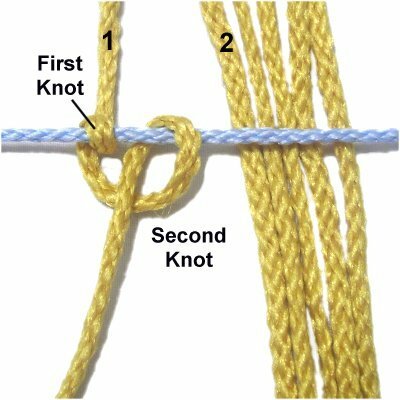 Make sure you tighten EVERY Half Hitch as described above. 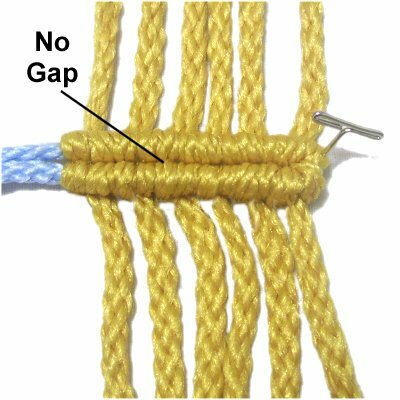 There should be no gap between the two rows, if you have tightened the knots correctly. 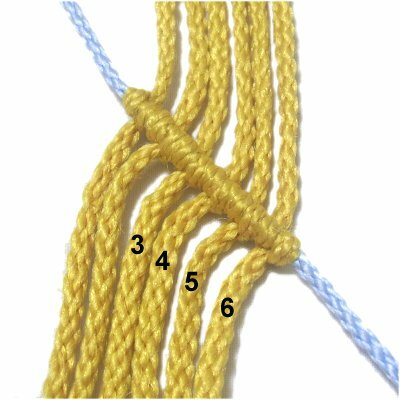 Repeat steps 1 - 5, tying one row of DHH. Move cord 1 to the right, and position it horizontally. It's the holding cord for the next row of DHH. 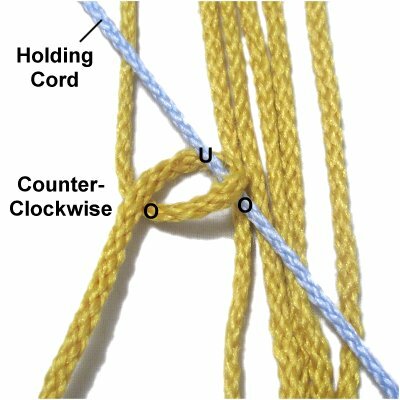 Make counter-clockwise Double Half Hitches with the remaining working cords (see tightening below). 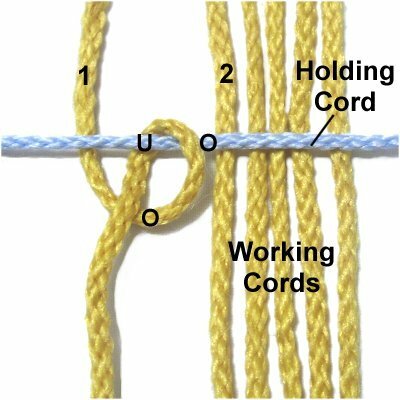 Remember to move the holding cord towards the previous row as you tighten each Half Hitch. Then let it relax before tying the next knot. The Diagonal DHH can be used to form a variety of designs. It's used frequently to make diamond and V shapes, as well as zigzags. Chevrons, leaf shapes, and other complex designs are also made with this technique. It's actually more common than the horizontal variation. Be sure to practice it in both directions, since you will use it often. Fold three 36-inch working cords in half, and secure them to your board vertically. Mentally number the cords 1- 6. Place a holding cord to the left of the group, and secure it on a diagonal slant. Make sure you stretch it so the cord has tension. Designer's Tip: Many Macrame patterns will have you use one of the working cords to hold the Half Hitches. When practicing, it's better to use a separate cord. Step 1: Move the first working cord over - under the holding cord, in a counter-clockwise direction. As you pull it left, it should pass over the working cord. Step 2: Tie the second Half Hitch with cord 1, placing it to the right of the first knot. Step 3: Repeat steps 1 - 2, tying the next DHH with working cord 2. Step 4: Repeat steps 1- 2, attaching cords 3 - 6 to the holding cord. Place a pin on the DHH made with cord 6, to support the corner. Step 5: Move the holding cord towards the left, resting on top of the working cords. Attach cord 6 to it with a clockwise DHH, so the end of the cord is heading right when you finish. Step 6: Attach cords 5 - 1 to the holding cord with DHH. 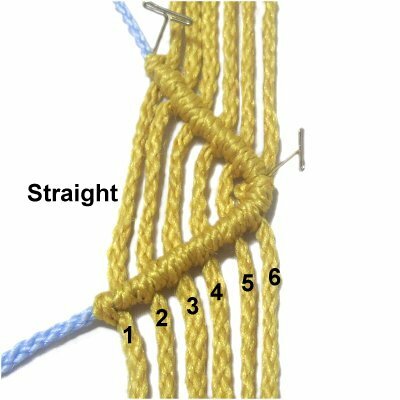 Make sure the segments between the two rows of knots are straight. Have any comments about the Double Half Hitch? Contact Me.